Nearly three years have passed since Ronda Rousey was knocked from her perch atop the bantamweight division and December will mark a full two years since Rousey’s highly publicized, heavily promoted “triumphant return” to action ended in under a minute. During that time, a number of women have had the opportunity to potentially step into the void left by Rousey’s departure and become the biggest star on the female side of the sport, but for various reasons, none of them have been up to the task. Holly Holm couldn’t translate the instant celebrity that came with knocking out Rousey in spectacular fashion at UFC 193 into a starring role in the Octagon, dropping the belt in her first title defense before going 2-3 over her next five fights. Miesha Tate’s come-from-behind triumph over Holm had the potential to catapult the former Rousey rival to a new level of stardom, but she didn’t make it through her first title defense either and retired from competition following another loss four months later. Reigning champion Amanda Nunes torched Tate to claim the title at UFC 200 before destroying Rousey in her comeback fight. Despite headlining a pair of events that generated over a million pay-per-view buys and collecting first-round stoppage wins over the two biggest female stars in UFC history, fans just haven’t gotten behind Nunes, opting to continue to penalize her for withdrawing from her scheduled bout at UFC 213 on the morning of the event instead. Joanna Jedrzejczyk appeared primed to take over for Rousey, but never got a chance to have the spotlight all to herself. After successfully defending the strawweight title fight times, she too was unseated in spectacular fashion and just like Rousey, she’s refused to accept her setbacks ever since. Current strawweight titleholder Rose Namajunas was saddled with the expectations of being “The Next Ronda Rousey” coming off Season 20 of The Ultimate Fighter, but everyone quickly abandoned that ship when she lost to Carla Esparza in the finale and needed a little time to gain more experience and develop as a fighter. Now that she’s on top, Namajunas is more interested in urban farming and staying true to herself than the trappings of stardom. Cris Cyborg is a menacing presence in the cage and a truly wonderful and giving human being outside of the Octagon, but for as dominant as she has been, even she hasn’t been able to ascend to new levels of stardom since arriving in the UFC. 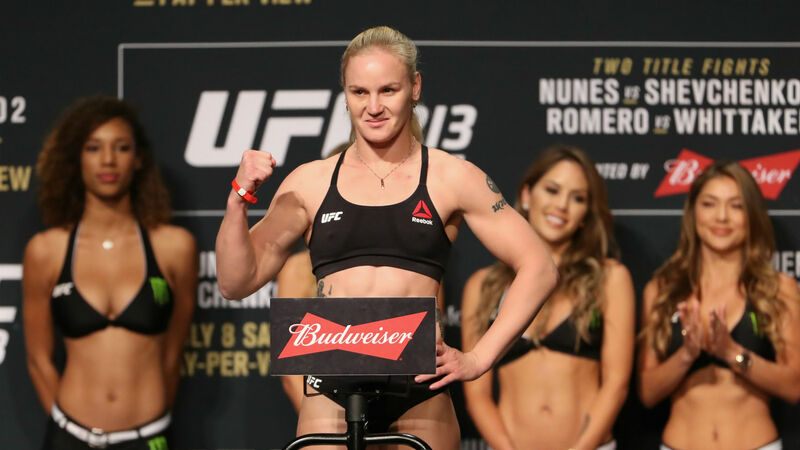 There are a number of emerging talents who have shown flashes of superstar potential, but in terms of competitors who could potentially step in and become the UFC’s next major female star right now, the best bet right now might be Valentina Shevchenko. The 30-year-old standout from Kyrgyzstan faces Nicco Montano for the flyweight title in the co-main event of UFC 228 this weekend in Dallas. Despite being the challenger, she’ll enter as a considerable favorite and a dominant victory could elevate her to new heights of stardom and position her as a potential breakout star for the organization heading into 2019. Shevchenko has established herself as part of the elite class, debuting in the UFC with a short notice win over former Strikeforce and current Invicta FC bantamweight champion Sarah Kaufman before adding victories over Holm and Julianna Pena. Even her losses to Nunes – the first in a non-title affair and the second with the belt on the line last September in Edmonton – were close contests that further solidified her place as one of the best female fighters on the planet. Although she doesn’t have Rousey’s Olympic pedigree and easy path to establishing a connection with the North American audience, there are a number of other factors working on Shevchenko’s favor that could play a part in increasing her star power. While Conor McGregor’s rise to superstar status was aided by having an entire nation behind him, Shevchenko could draw support from all corners of the globe if positioned properly. Secondly, she’s already proven that she won’t take her ball and go home when faced with adversity or cling to her version of events when she lands on the wrong side of a close result. Rousey lost the audience when she reacted poorly to being defeated by Holm and Nunes, and Jedrzejczyk’s refusal to acknowledge Namajunas as the superior fighter despite having lost to her twice is costing the Polish star fans every time she speaks about it. It shouldn’t be a factor in calculating a competitor’s potential as a star and the fact that it is such a significant piece of the equation for female athletes is preposterous, but it would be naïve not to acknowledge that perceived attractiveness plays a part in these things and the blonde-haired elite athlete ticks a lot of the “conventional beauty” boxes. Now let’s see if the UFC can translate that into something more. How old is Tom Daley, why is diver not competing in Glasgow, and when was his and Dustin Lance Black’s son born?